Does anyone know how i can add a link to a larger version of my render? I have the image loaded up on Photobucket. this is my second post after Sir J.Birn detail post on my render, thank you Sir and other people here for your valuable comments which i really care. i am trying my best to keep in touch with you all besides my tight projects deadlines till the end of this challenge. I guess its a bug in maya2010. just try this- open the scene;check the “gi photons” for accessibility;if not go to render settings>first uncheck Global Illumination and again switch on GI. Now check for the accessibility of spotlight photons.It must possibly work now.The trick is to just refresh the GI by unchecking and checking. I havent been active for quite a while in the challenge, my apologies, we are busy with a vfx project at work that required my full attention. I think your reds are very glowy and the dirt or darker colors of your copper are very strong, I would make that a lot softer. 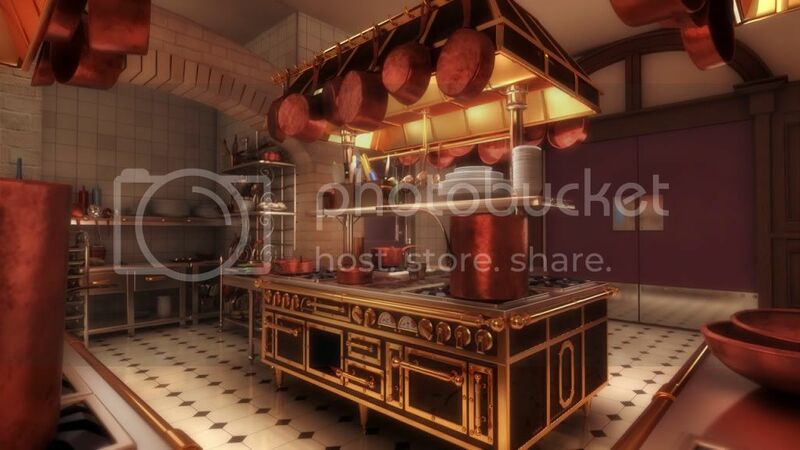 I really like the detail on the stoves and the floor reflections a lot. Assadshk21 ,I liked what you have achieved so far here are few suggestions you might like to incorporate in your image. [li]The front 2 bottles are too distracting for me,try avoiding at least one of them. [/li][li]Your center light seems to be bit too bright and so is the highlight on the floor. [/li][li]Yellow light on front right is bit too saturated . [/li][li]Also try to reduce the specular on the silverware situated on upper right shelf. [/li][li]Under the hood(left) I suppose one of the plate is receiving too much light[/li][li]The blue from the sky is not playing much and try to make it blend with the whole scene. [/li][/ul]I liked your rendering and I thought you can further improve it hope you like my suggestions. yogeshsherman, Thank you for appreciation, definitely I like your suggestions which very clear to me, I know these will really help to improve for render, I hope you can see these things fix in my next post soon, thank you. I call it 80% complete… I need help to achieve the rest 20%. punks I don’t know what sort of Final outlook you have in mind ,so may be I am wrong since you claim it to be 80% complete but according to my view it is still at nascent stage and you need to take care of few of the following things first. [li]Door and walls are too flat. [/li][li]You might also need to work on your materials specially those which are in focus like glass bottles etc. [/li][li]It is still not clear what is you main light source. [/li][li]Under the Hood probably your omni light sources are not placed in a proper way . [/li][li]May be it’s me but I think there are some artifacts on you metallic Bowl sitting on table. [/li][li]I recommend you should play with lights little more as current render is bit too flat for my liking. [/li][/ol]I hope my personal views would help you improve your rendering. Thanks a lot yogeshsherman.!! I really appreciate your concern… I’ll definitly fix inner hood and bottles. but i’m not sure wat artifact you see in the bowl on table. I even think scene can get more illumination from outside…I’ll update my image soon. Hi everyone, here is an update of my work. Still a lot of work to do, but that is where I am for now. I’m really not fond of the pea ( not sure how to translate it ); maybe because of the specular. It misses some shaders ( I don’t know how to begin the bread ). If you any ideas on how to improve this image, I’ll be glad. wouarr ,you already knew the stuff which still needs to be improved e.g. peas ,specular and reflection on some of the cooking utensils. Also once you fully shade your scene it’s look will definitely gets enhanced. Your window is too bright and it’s getting all the attention instead of interior of kitchen try using some background image for window. Add slight translucency and specular to your peas they will come good. You should also add bit more bounce under the shelf it is getting too dark compared to the rest of the image. @ yogeshsherman : Thanks for the feedback mate, it’s really helpful. I did change my mind a lot of time between the focus on “tomato-curry” and on the “peas and tomatoes”, I’ll give a try on the first. Others issues ( bounce, spec etc…) will come asap. Hi all, this is my very first post and entry on cg society. There’s been very inspiring renderings so far! I’m at a stage where I could really use some feedback, so here’s my rendering done in maya/ mental ray. I’m planning to adjust colors, brightness etc afterwards. Firstly, Kudos to everyone whoever participated in this lighting challenge. There are many great entries from many folks and love everyone of it. I specially love the work from Kevin van den Oever, Ben Cooper, Assad Sheikh, Maria Kosheleva and a few more but forgot their names . Thanks Kanooshka, Jeremy Birn and fellow artists for the valuable feedback and making this challenge a lot more fun . This is probably my final render and won’t be able to make any changes further as the deadline is closing in. I have added the rat and made a few changes to lighting as per the previous comments. Hope you guys like my final version. However, I would like to adjust the color overall to closely match the reference image. Once again, thanks a ton!! Nice work niravsheth, your render really looks great. 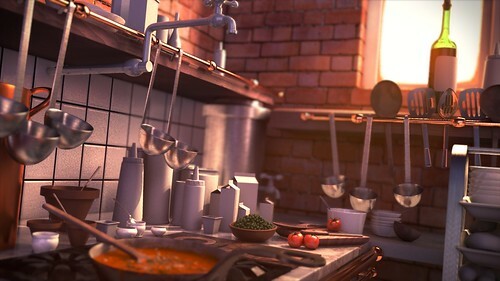 I liked it and may be that is reason I couldn’t stop myself in pointing out few points you might like to think of incorporating in your render. Probably if you can add bit more of that purple light to the adjoining wall it would become more part of the scene itself. You should also try some grading on that walls to make them look more interesting. Your pumpking should receive bit more light probably more fill instead of strong highlight. Grapes ,pears and the fruit behind orange should have more fill light. Probably you would also like to reduce that yellow light on the shelf which is seeking attention. The Donuts on the plate have some very sharp high light which is contradicting it’s surroundings. Again I would say a great effort and a nice shot selection. Hey niravsheth , Very nice and clean render ,I really like your work, best wishes with you keep it up. yogeshsherman , having you here really helps me very much and I am sure other people as well , thank you for sharing your suggestion with us. I am uploading my progress after considering every little thing and suggestion people shared with me here in this challenge which helps me learn a lot, this upload is my second last and I like everyone to quick share suggestion so I can finish my final render and summit before 22Aug. This challenge with such nice artists is valuable for me, this is my first time here in lighting challenge beside my job in my whole career and I will try my best see everyone in next challenges. Assadshk21 Nice improvement going good ,I have uploaded a quick paint over  which might give you a rough idea  about few things you might like to do. also please try decreasing the specular of silverware . your spilled liquid on ground looks bit pasted as contact surface seems missing might try increasing OCC also decrease it's specular too and it is bit burning.